Six-year-old Imogen died in 2010 from childhood cancer but she lives on through a hand-made ladybird brooch mum Fiona is selling for the charity until May 1. The foundation, which grants wishes to seriously ill children, sent the Alexander Heights family on a Queensland holiday in 2009. Last year, ‘crafty’ Fiona set about giving back to the organisation by creating the wooden brooch so other families could experience the ‘magic’ of a wish granted. ‘While Imogen left us nearly three years ago, she is very much with us,’ Fiona said. The green brooches in Imogen’s favourite colour sell annually over a week that includes her birthday on April 26 and anniversary of her May 1 death. ‘Imogen had a fondness for ladybirds, something she shared with me and the women in my family,’ Fiona said. ‘For us, the ladybird represents luck, innocence, magic and joy. ‘During a treatment session, a little ladybird somehow made its way into the completely sterile treatment room, earning Imogen the name Princess Ladybird from nursing staff at Princess Margaret Hospital. 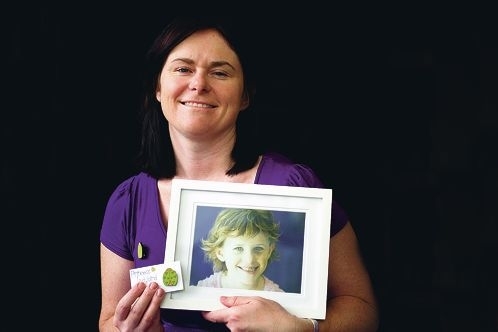 Fiona hopes to double last year’s $1650 proceeds from the brooches, which are $10, available from www.|imogensangels.com.au.